This statistic shows the percentage of students who were in default on their students loans as of 2013 after attending different types of higher education institutions in the United States. 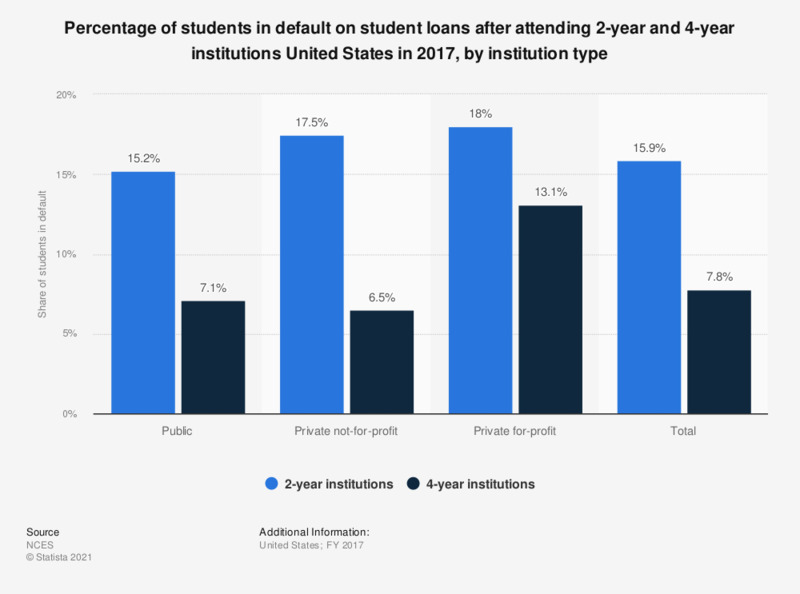 Around 18.3 percent of student who went to public 2-year institutions were in default on their loans. The default rate for students in the FY 2014 cohort was 9.0 percent at 4-year degree-granting postsecondary institutions and 18.2 percent at 2-year degree-granting postsecondary institutions. Depicted here is the 3-year cohort default rate: The 3-year cohort default rate is the percentage of borrowers who enter repayment on certain Federal Family Education Loan (FFEL) Program or William D. Ford Federal Direct Loan (Direct Loan) Program loans during a particular federal fiscal year (a fiscal year runs from October 1 to September 30) and default or meet other specified conditions within the cohort default period. The cohort default period is the two-year period that begins on October 1 of the fiscal year when the borrower enters repayment and ends on September 30 of the following fiscal year. Default rates were calculated using student counts by institution from the Federal Student Aid Cohort Default Rate Database and the IPEDS classification of institutions.